Hello there… i need some guidline. I got a sweety baby . attaching picture. I want to know what to feed him. Currently i am giving him cereal and chna daal. Please help me so that it could make a perfect pretty boy someday. And another query. i have grey IRN.i bought previous year in May..Picture is attached. is he going through molting ? he is in such condition since he was 7months old. I am feeding him seeds. peas, apple, banana. (daily bath) Plz.guide. When would he have his tale all grown up again. and feathers all shiny. Thank you for the questions. Let me start by telling you that I love the photos you attached with your questions. 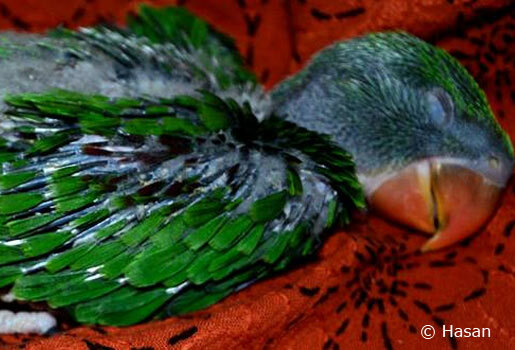 I especially liked the one with the baby Alexandrine sleeping. It’s a great photo and it shows what most baby creatures do–eat and sleep. Such innocent little guys, eh? Let’s get to your first question that pertains to your baby Alexandrine getting a healthy diet from the start. A ringneck diet should be based mainly on high carbohydrates, some fats, and small portions of protein. Items such a rice, beans, and legumes can be given as a staple. The best rice to feed are brown and long grained rices. If you have access to brown basmati rice, this is perfect. These slow digesting carbohydrates are perfect as they are high in fiber, are plant based, and help to give the ringneck the proper energy needed throughout the day. In fact, cooked brown rice is perfect as you can add many healthy blended vegetables such as broccoli, kale, spinach, peppers, or even fruit to the mix. When I feed my Indian Ringnecks/ Alexandrines, I’ll make a base diet of basmati rice, mixed with kale, dandelion leaves, sweet potatoes, yams, dates, and different peppers. My parrots enjoy them and the diet is naturally high in Vitamin A. As a result, my parrots feather out beautifully. Archimedes, Devri, and Osiris are perfect testaments of being healthy birds. They have vibrant colors, glossy feathers, strong feathers, and most importantly they are healthy. Did you know that for the last eleven years Archimedes has never been sick? He is one healthy bird and I strongly believe his diet will keep him well into his twenties. As mentioned above, healthy fats need to be given too. Healthy fats are important to your ringneck because they offer the bird essential fatty acids. This helps their brain function properly and ensures their feathers are healthy too. The amount of fat your bird receives should make up no more than roughly 10 percent of his diet. A teaspoon of seeds a day should be fine. The best fats are those found in walnuts, flax seeds, or almonds. Other sources of healthy fat can be found in organic palm oil or coconut oil. If you do select a palm oil, particularly red palm oil, just be sure it’s through a reputable supplier that does not damage the environment; look for sustainable palm oil brands. I find that if I use nuts and seeds for training that’s enough to meet my ringneck’s health requirements. My birds work endlessly for walnuts. Besides, walnuts used as reward items keep my birds interested in longer training sessions. I might also say that too much fat is not good either. Too much fat can shorten the lifespan of your ringneck. 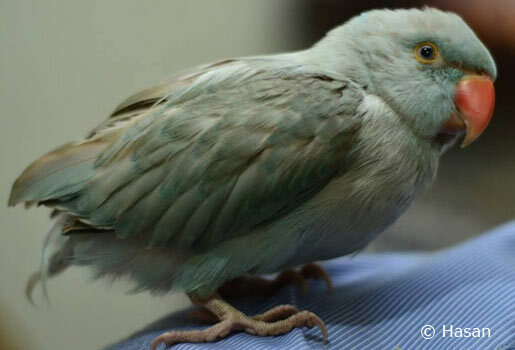 A lot of birds that are fed diets higher in fat tend to develop fatty liver disease. Now, for the protein part. A small piece of chicken or lean meat is ideal. I don’t know if you have access to meal worms or wax worms. If so, they are perfect as they are low in saturated fat and are natural food items that be given periodically. If you cannot locate these larva, or find this to be just gross, try cooking some egg whites and giving it to your bird once or twice a week. If you have access to pellets they too can be given as a stable. Look for an organic brand. If they are used, they need to placed inside a cooler environment as they can easily absorb humidity and spoil. I hope this helps give you an overview of feeding your young Alexandrine. Should you have any more questions, please register on our forum as we have the best ringneck family around. The other question was about your gray Indian Ringneck. It is obvious from the photo he/she has no tail. I can’t tell from the photo, but perhaps your ringneck broke the tail feathers while it was younger. Or, it could be that your bird might resort to feather mutilation and pull them out. If the tail feathers are indeed broken, it takes about a year for them to regrow. Most people believe feathers are a lot like hair that continually grows, not so. Feathers only regenerate once they have been molted or plucked from the follicle. The best thing to do is wait for your ringneck’s next molt and see if new feathers have grown in. If however, you believe your ringneck is pulling its tail feathers out, you should do some research into feather plucking. It is quite a serious and complicated matter and can take years to reverse. I’ll link a wonderful article on the topic to help get you in the right direction. Check this article about feather plucking. Anyway, I hope this helps answer some of your questions. 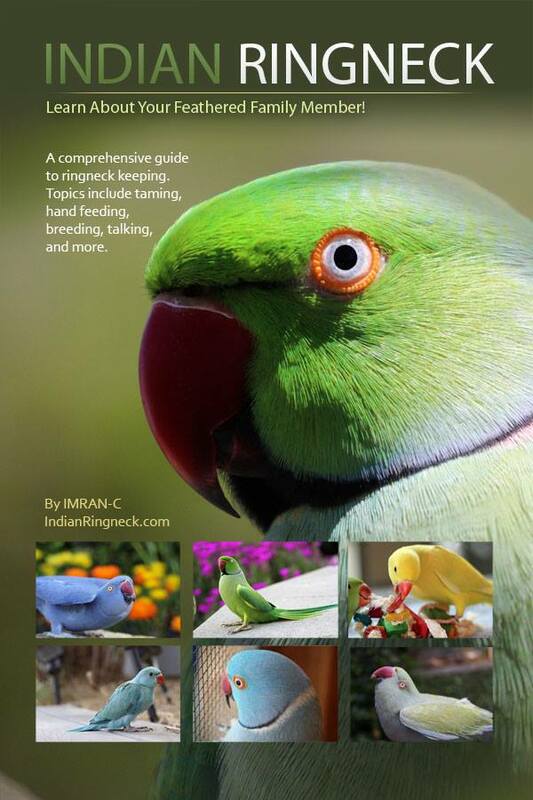 Should you need more help, don’t hesitate to register on our Indain Ringneck forum.